Some of you have noticed from my last post, HERE! How my skin was glowing in the picture. I would love to take all the credit for it but it is actually this beauty product that gives me that glow. The Winter weather has not been very nice to my skin actually. I have been breaking out a lot, I do have dry patches and all over just looking dull. I have amped up my moisturizer to keep my skin hydrated and drinking a lot of water all day. I have given my argan oil a break this winter since I am trying out other skincare products and this could also be a factor on my dull skin. 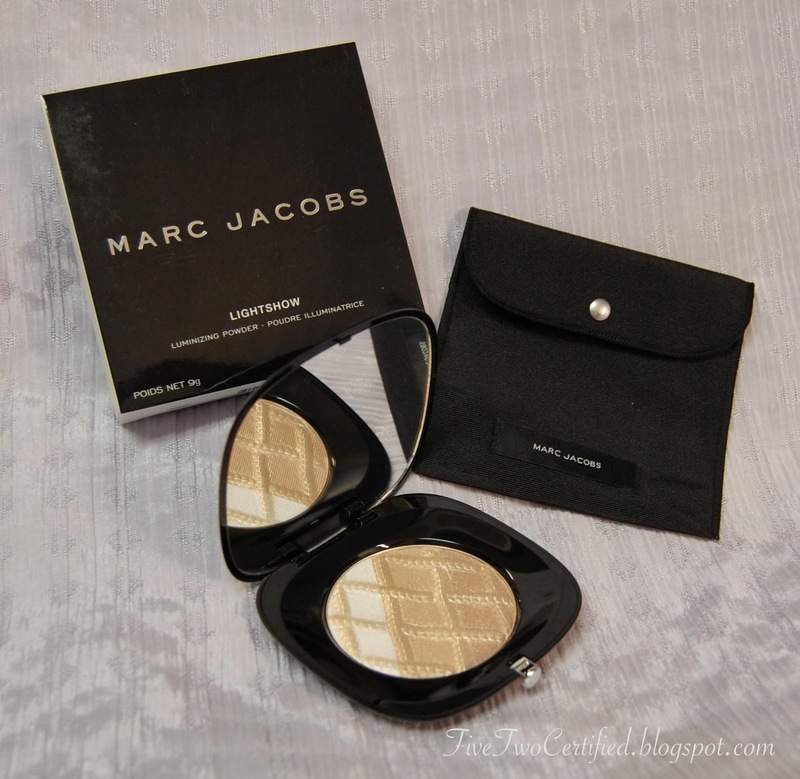 This is a limited edition Marc Jacobs Beauty product that was inspired by the Fall Marc Jacob's 2013 Runway. *I purchased mine during a Sephora Sale back in December and this is my very first Marc Jacobs beauty product! 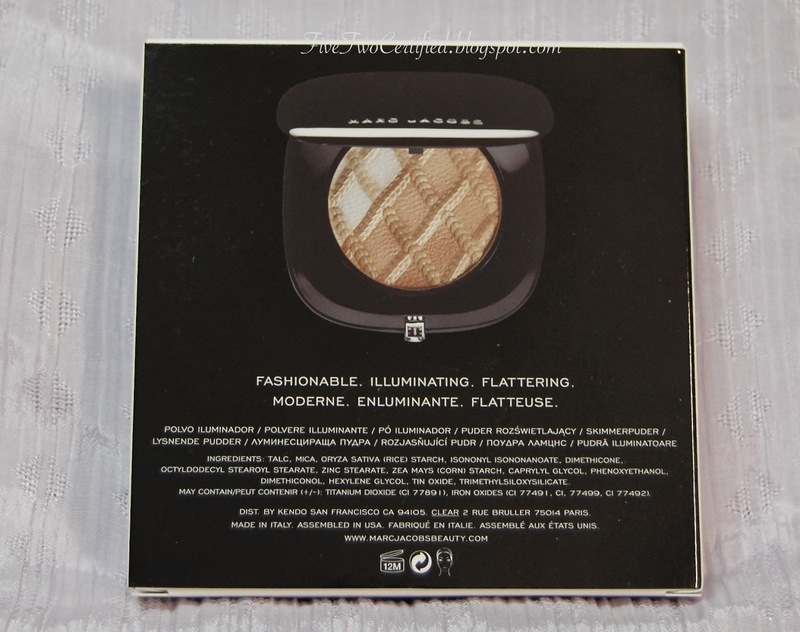 A limited-edition luminizing powder inspired by Marc Jacobs’ Fall 2013 runway show. This multidimensional powder flatters all skin tones by diffusing light and minimizing imperfections. The formula provides a subtle glow with a universal blend of three complexion-brightening shades, dusted with gold accents for a radiant, glowing complexion. The powder comes in this black pouch with a snap closure. 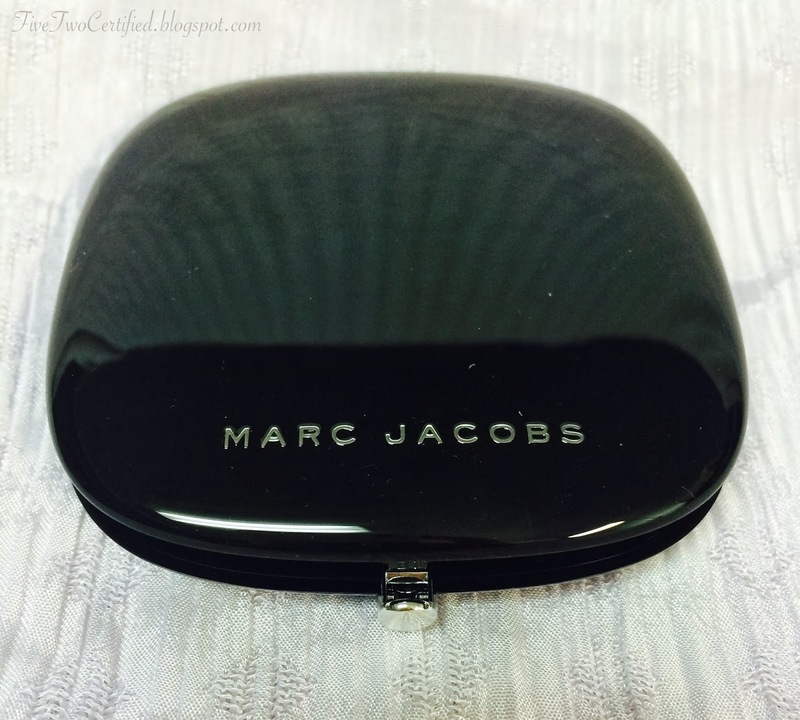 Like every Marc Jacob Beauty packaging this comes in that nice sleek black case with a silver "button" you press to open the case. The compact's overall size is pretty big, bigger than the palm of my hand but it is still comfortable to hold. It has a nice big mirror inside when you need to touch up or need a mirror on the go. The powder has a gold dusting on top which will eventually come off after using it for a while. There are three shades underneath (white, light brown, medium brown) which can be used individually or swirled altogether. 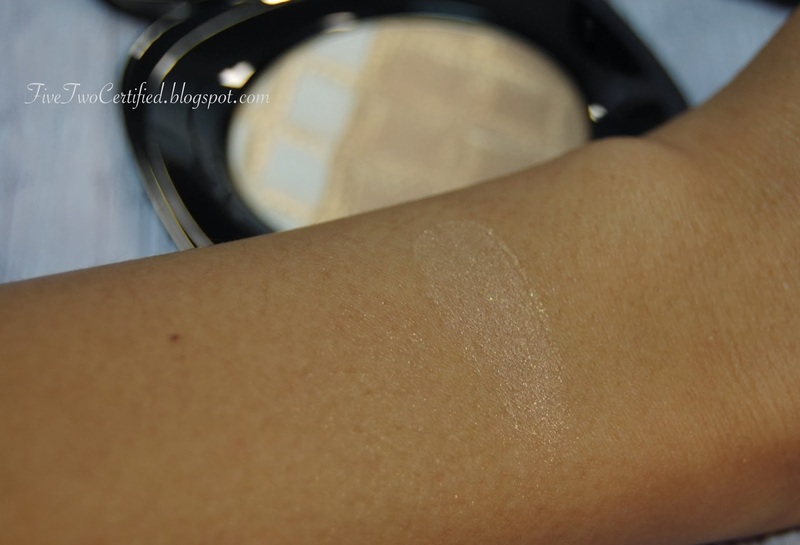 once the gold dusting is gone, the powder is pretty sheer and was hard to get a swatch. Do read my verdict about this instead. 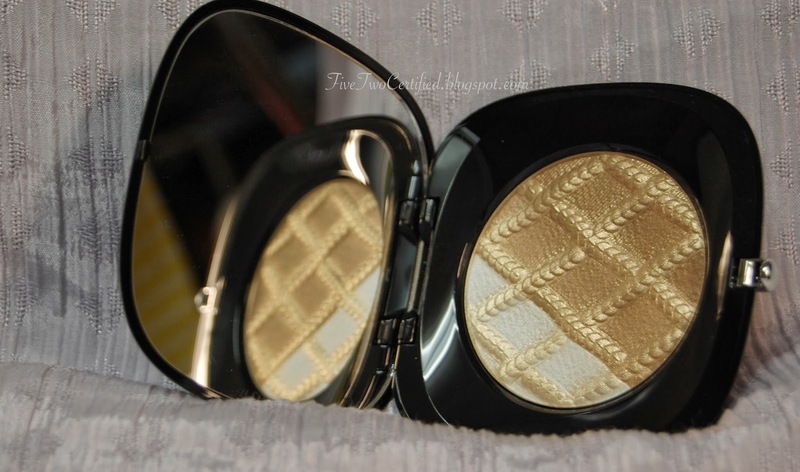 The gold dusting on top was very shimmery and so at first I only used this to highlight my cheekbones and only at night. I think the gold shimmer was too much for a daytime look. Once the gold dusting was gone, the finely milled powder was pretty sheer on the skin and it does leave the skin a nice beautiful glow. I used it at first with a powder brush all over my face and I felt like the whole look was just too "glowing" for me, especially I get oily on my T-zone after a few hours. After playing with it, I learned that using my ELF Studio small tapered brush to pat mostly the white and middle color under my eyes towards my cheekbones - works really well for me! My skin has that nice healthy looking glow and not looking oily at all! I love Marc Jacobs Beauty packaging, it doesn't feel flimsy nor cheap. It has that nice sophisticated feel to it every time I whip this thing out. I always keep it in the pouch so I don't know if it easily gets scratches but I do suggest to keep it in the pouch if you can. Overall, I am really happy to have bought this on such a good deal! I will agree that this will compliment any skin tone. This definitely gave my dull, dry skin that nice glow that I needed. If you get a chance to find this online, don't hesitate and get it. It is a bit steep for the retail price but what limited edition product isn't??? Here is a picture from my previous post where I used the powder under my eyes towards my cheekbones. I dabbed whatever is left on the brush in the middle of my forehead and top of my brows. 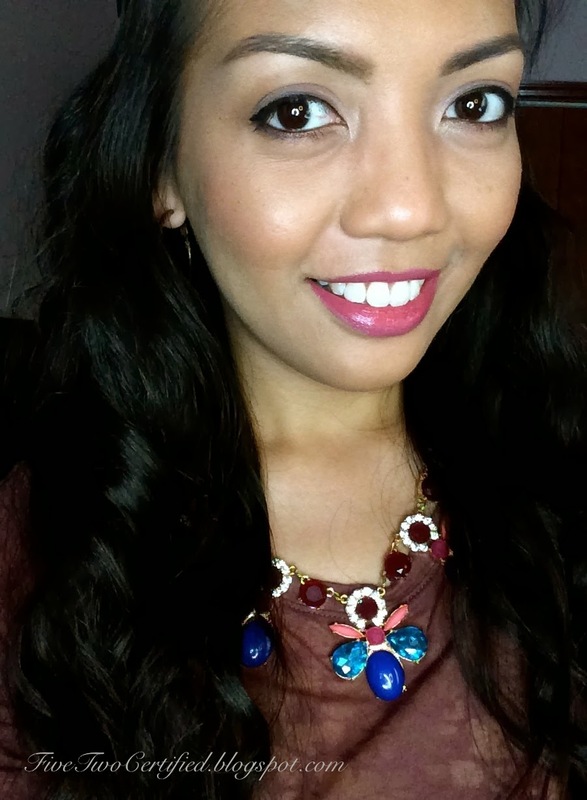 I used the light from my SimpleHuman Sensor mirror (which I wrote a review about HERE) since it is the best white light that shows the makeup really well on pictures. *update 4/22/2014: Also check out www.simplehuman.com to see more other SimepleHuman products. If you would like to know what makeup I used on this look, just click HERE and it will take you to that blog post! Do you guys have a favorite highlighter or luminizing powder or whatever you call it to fake that healthy glow? Let me know in the comments below!